Overlord season 1 anime has been a great success and it is arguably one of the best anime of 2015. 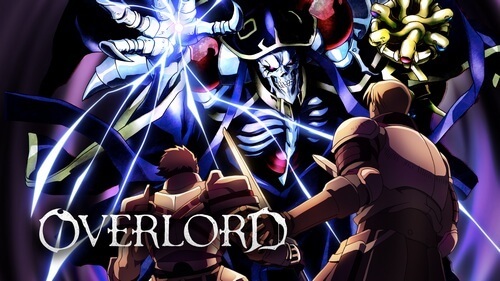 Although the series follow the traditional trend of “isekai” (basically about main protagonist resurrects to another world), Overlord series has managed to build its own unique setting and core concept. As the results, we have an excellent Overlord season 1 anime with compelling storyline and interesting characters. And as Overlord 2 (or Overlord season 2) already on air, let’s have a first impression about the series so far! *Note: By the time of this first impression, only 3 episodes of Overlord 2 has released so far. For those who have unfortunately missed first season of Overlord back in 2015, it is the anime adaptation of a famous light novel series with the same name. There is also a manga adaptation released in Japan starting from 2014 while the English version first released in 2016. The series tells a story of a young man named Suzuki Satoru who worked as a business man in Japan. He was a veteran player of a famous online game called YGGDRASIL under the name Momonga. When the game was officially shutdown, Momonga (or Suzuki in real-life) decided to stay in the game until its end. But for some reason, he got transferred to a totally new world with totally different setting. And to more surprises, Momonga still retains his character form just like in YGGDRASIL, or to be more precise, he truly becomes his own character in-game – a powerful skeletal Overlord. Not only that, Momonga found that his guild base – the Great Tomb of Nazarick – also transferred to this new world along with its NPCs who are actually living and breathing like real entities. Now, Suzuki under the new identity as Momonga and his Nazarick NPCs have to discover this new world and possibly, find his fellow YGGDRASIL players if they ever got transferred like him. In overall, the first season of Overlord anime was quite a great success as it managed to capture the essence of the original light novel. The visual is great and the sound is fantastic, just like what we can expect from MADHOUSE. The main protagonist Momonga – Ainz Ooal Gown did give out a badass feeling of an overpowered skeletal mage. And even though he is extremely powerful in this new world, he shows relatable personalities of a strong character, yet careful towards everything since he is living in an unknown realm. Other characters like denizens of Nazarick are all interesting and fun to watch. From our viewpoint, Overlord season 1 is a great anime we gave it 8/10. 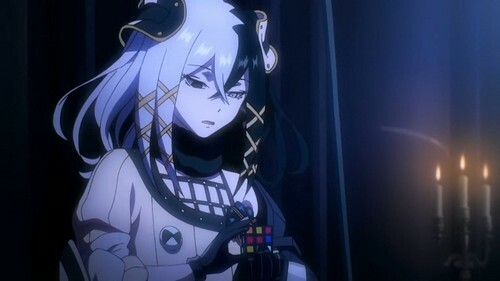 It is really entertaining and especially if you are interested in Overlord 2, we recommend checking out this season 1 first in case you haven’t viewed it. Frankly speaking, there is not much to say about visual and sound in Overlord 2. Since this is MADHOUSE who was behind the production of the anime, Overlord 2 looks as gorgeous and impressive as ever. Everything from landscape to character designs is still able maintain their beautiful appearance and details. The animations are quite smooth and enjoyable. There is a certain degree of 3D animation here and there but it does not really bother our personal experience. Background music and sound effect are also good and able to recreate atmospheres. After the incident of which Shalltear got mind-controlled by a World-class item and fought with Ainz, Nazarick denizens in general seems to raise their cautiousness towards the New World. What happened with Shalltear has proved Ainz’s statement that this world fills with unknown dangers and even powerful beings like him can be threatened. 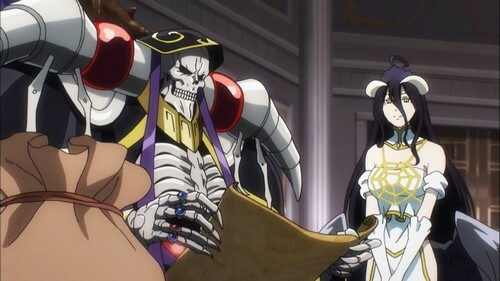 The first episode of Overlord 2 serves more like a quick round-up of Nazarick’s current situation and what Nazarick denizens have been doing: Ainz and Narberal still works as adventurers Momon and Nabe in disguise, while Albedo is in charge of managing the Great Tomb of Nazarick while Ainz is away… like a “wife”. Sebas Tian and Solution disguises themselves as royalty members to gather information in E-Rantel, while Demiurge is developing new type of scroll to allow them transfer information and contact each other safely. The twin Aura and Mare keeps doing their world on expanding and hiding the presence of Nazarick. And Cocytus? He is preparing for war. 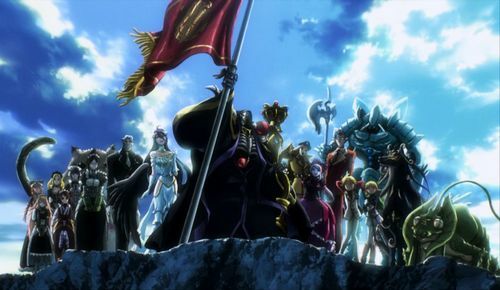 The second and third episodes focus on the war between undead army of Nazarick and the lizardmen tribes. Nazarick’s army is led by Cocytus while the lizardmen tribes have to unite if they want to survive this war. The interesting part is: the army of Nazarick only includes weak undead warriors (in YGGDRASIL’s standard). In addition, Cocytus has to decide things all by himself and he is not allowed to ask other Guardians for suggestion or help. Frankly speaking, these 2 episodes are not exactly good from our perspective. The story mostly talks about how the lizardmen unite and how the two lizards… love each other? Although the story is not bad by itself, it seems MADHOUSE rushed this arc too quickly. The 2 episodes do not give viewers enough reasons why this lizardmen war comes to pass, why Ainz ordered Cocytus to lead the war on the lizards. The duel between the Green Claw tribe’s emissary – Zaryusu Shasha and the Dragon Tusk tribe’s leader – Zenberu Gugu is also rather dull and uninteresting. The war portrayed in episode 3 looks good enough; yet, it still does not feel that fascinating. Some may argue that when the hydra Rororo charges towards the lich Iguava, it does feel emotional. That said, personally we do not feel this part to be convincing enough. The bond between Rororo and Zaryusu was not emphasized here and therefore, we don’t feel Rororo’s heroic deed to be convincing enough. To be fair, this Lizardmen Arc is actually not half-bad when we consider the manga or the original light novel version. This arc is supposedly a test for Cocytus; and an experiment by Ainz in general. Ainz appointed Cocytus as the general of an undead army since Cocytus is more of brawn character rather than a strategist. That is quite understandable since back in the game YGGDRASIL, Cocytus is purely emotionless NPC. However, in this New World, all NPCs including Cocytus possess emotion and thought like real beings. Therefore, Ainz wants to test Cocytus to see whether these “NPCs” can develop in both form of intelligence and mind or not. 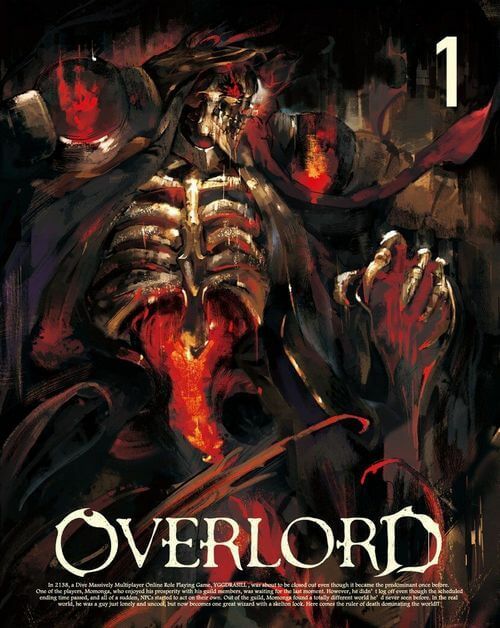 If you have already read Overlord manga, this arc is actually well written and nicely portrayed as it explores more about the characters. However, this anime version seems to be rushed and it lacks the charm towards viewers. Of course, these first 3 episodes cannot speak for the entire show itself; however, we can say Overlord 2 has a pretty rough start. Some people also complain that the main badass protagonist Momonga – Ainz Ooal Gown does not show himself much here. To some extent, we think it is understandable when we feel disappointed due to the lack of our favorite main character. That said; this is actually what Overlord series focuses on. Personally we have no problem in seeing less Ainz in action. The beauty of Overlord lies within this very “lack of protagonist presence” since it creates space for other characters to shine. Let’s remind us all that right off the bat Ainz Ooal Gown was established as an overpowered figure. He can easily destroy everything on his path and this exact type of character can make things boring. Therefore, Overlord’s direction is to make a powerful, yet thoughtful and careful character. Ainz does not act rashly, he thinks carefully before he acts. As the results, the world of Overlord also needs to provide compelling side characters and mysteries. And at the same time, it needs time to establish different characters with different personalities and motives. For those who prefer more protagonist’s actions, we doubt that you will find this second season of Overlord interesting. But as long as you can get along with it, you will probably have a good time with the series. 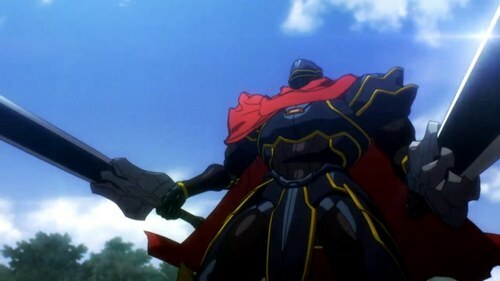 In terms of characters design, we would say characters in Overlord are all well portrayed with nice details, from the Supreme Leader of Nazarick – Ainz Ooal Gown to the lizardmen. As always, characters from Nazarick look interesting and their personalities are fascinating to watch. 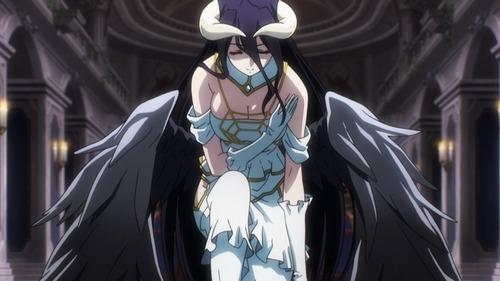 Albedo is still the “best waifu” fans hope for, while Demiurge gives out that weird, yet fascinating and mysterious gentleman devil vibe. The twin Aura and Mare looks adorable and somewhat childish, but that is what they are originally designed. Shalltear shows quite hilarious time as she is still depressed because of her fight with her “Ainz-sama”. Cocytus still looks as cool as ever, and we get to see more of his character development since this arc focuses mostly on him. Overall, every time we see Nazarick’s denizens, we always find them interesting and enjoyable. But what about other side characters? 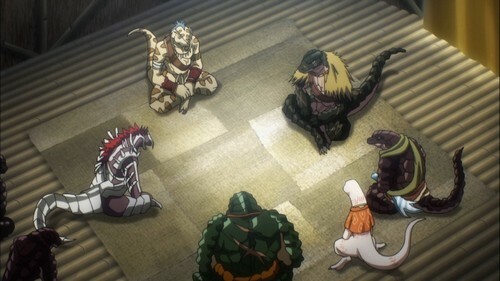 In the first 3 episodes, side characters we mostly see are the lizardmen, typically: the brothers Shasuryu Shasha and Zaryusu Shasha, Crusch Lulu – leader of Red Eye tribe, Zenberu Gugu – leader of Dragon Tusk tribe, and few other lizardmen tribe leaders. Truth be told, we don’t see these characters are freshed-out enough. We don’t exactly feel interested in these characters, except for the fact that we want to see how they will be slaughtered by Cocytus and his undead army. As mentioned, the duel between Zaryusu Shasha and Zenberu Gugu would have been cool if MADHOUSE focused more. Unfortunately, since the arc seems to be rushed, the duel between these characters also suffers the same fate. The best thing of the first 3 episodes is probably the meeting between Zaryusu and Lulu. 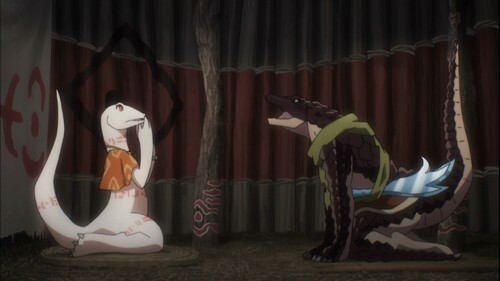 It is somewhat hilarious to see a lizardman flirting a lizard-lady while they are supposedly discussing about the war. But that aside, our overall impression with these new side characters are not exactly as good as we wished to. Generally speaking, Overlord 2 has quite a rough start in our opinion. 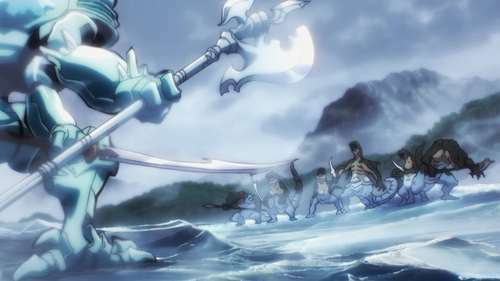 Besides from the first episode which did a great job in rounding-up what’s happening in the New World so far, the later 2 episodes didn’t really do their justice in portraying the “epic battle” between the lizardmen and the undead army of Nazarick. Of course as mentioned, the first 3 episodes cannot speak for the entire show by itself. That being said, we already see a certain amount of viewers feeling disappointed with Overlord 2, at least for now. Some people demand more of Ainz and Nazarick’s actions; however, personally we don’t see this is the case. Side characters development is one of the important elements of this series since they need to build tensions and mysteries for the main casts to deal with. And at the same time, this is the hardest work since MADHOUSE had to deliver as interesting side characters as possible. At the moment, we would give the first 3 episodes of Overlord 2 a 6.5/10. Remember, this is not a final verdict of the entire season 2. There are still lots more events, characters, and stories waiting to be shown, and for now, let’s hope that Overlord 2 will eventually keep up with the hype! Thank you and stay tune for more news in the future! Pingback: Get Set! Go! The Top 10 Most Anticipated Anime Spring 2018!